This meme is the second generation of My World Tuesday, which was founded by Klaus Peter of Florida three years ago and which published faithfully every Monday until Klaus's passing. Klaus created the meme as "the place where you show others the area around you and become our Tourist Guide!" It has been a family-friendly meme that has brought together hundreds upon hundreds of people from around the world who have shared with each of us cultures and experiences we might not otherwise have encountered. My World has inspired us to look around the ordinary place we call home and find in it what is extraordinary. 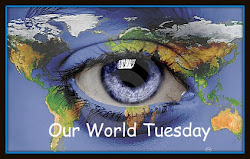 My World has taught us to look at and think about our world as a gift to share with our friends around the world. Klaus inspired us to celebrate the wonderful and beautiful in the here and now. We honor his memory and each other by continuing this meme.